Upright Gallery presents the newest work of Michael Kay Terrance. Sutherland will be home for the first space station in Britain as it is deemed the perfect position for low orbiting satellites to be launched from. In recent years Sutherland, Highlands and Caithness have spent a lot of time and money reinvigorating the community through the environment, natural history and the heritage of the area. The proposed space station will be situated outside Dornoch, located in an environment where the natural ecosystem is thriving. The proposal was put to a vote for the local crofters to decide, however they ended up not taking part, and so the proposal was successful with a majority of 55%. Michael Kay Terrance is from the area. He feels that it is a massive backwards step that the local councils have taken in supporting this enterprise. This thought-provoking sculpture was launched at the proposed site near Dornoch. It is the first ever eco-friendly space rocket and it is absurd. 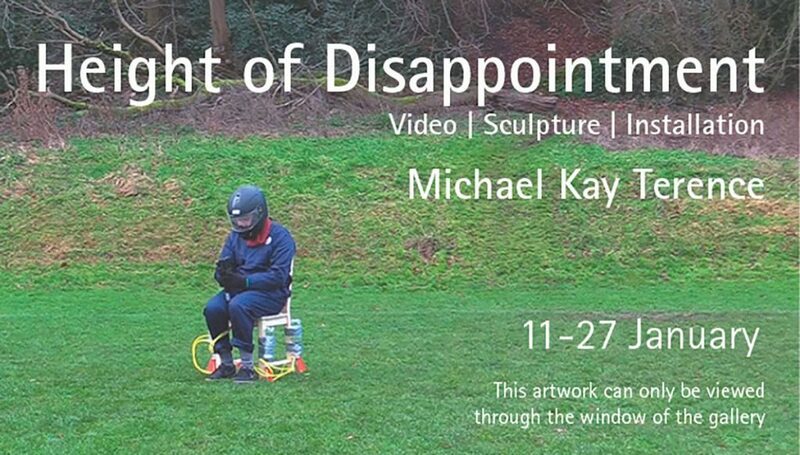 Michael Kay Terrence’s practice combines minimalist sculptural forms with video and contains an element of performance. By stripping away the unnecessary he forces us to focus on our own reality with a sense of wit and irony. Other thematic interests include; the material, the void and raising questions about the nature of the artwork. The artworks must not be constrained by the authors intended meaning, imbued at its creation, but in the mind of the viewer and the context in which they experience the work. On Saturday 19th January at 1pm, Michael Kay Terence will enact another launch of his water-powered rocket.